New Society Publishers is committed to facilitating social change and its mandate embraces a broad social transformation toward sustainability. But New Society Publishers goes beyond simply publishing books on topics such as globalization, green building, renewable energy, conscientious commerce and sustinable living. As a business, it walks the talk. In 2005, New Society became the first North American publishing company to become carbon neutral. The company has also received the Ethics in Action award in 1997 for ongoing social responsibility, and again in 2002 for environmental excellence. All of this is not surprising, given the activist roots of its principals, Christopher and Judith Plant. Chris Plant started his publishing career in the South Pacific as an organizer with the Nuclear Free and Independent Pacific movement and as an editor with the Institute of Pacific Studies in Fiji. Judith Plant is a former adult educator who became an author with the release in 1990 of her highly successful book, Healing the Wounds: The Promise of Ecofeminism published by New Society. We recently interviewed Chris and Judith Plant about the focus and direction of New Society Publishers. FPP: How did you come to choose publishing as a way to express your activism? Chris & Judith: Getting the word out is a large part of activism of any kind; you need informed people to make a difference. We originally started publishing a magazine to enable communities scattered over a large geography to know what their issues were and how they were dealing with them. Oftentimes, they were facing similar struggles – forestry, watershed issues, toxic wastes, etc – and having to reinvent the wheel over and over again instead of being able to learn from each other. Sharing issues and solutions became the meat-and-potatoes of what we published. FPP: You have described yourselves as bioregionalists. Can you explain what that means and how that has affected your day-to-day operations and publishing decisions? Chris & Judith: The bioregional view sees the local as the focal point, the locus, of all action. We all live in a place, and caring for that place is the most immediate thing one can do. Understanding your place used to be the key to obtaining your water, your food, and your security. But in a globalized world, that all changed. However, as the global system crumbles through the pressures of Peak Oil and other long emergencies, the ‘local’ promises once again to become the most important aspect of most peoples’ lives. The Relocalization movement is all about this trend. FPP: New Society Publishers is on Gabriola Island in the province of British Columbia. Does that present challenges for you? Chris & Judith: Only if you miss the city! No, it’s an ideal life here. We’re on a beautiful Gulf Island in a quiet piece of forest, a short walk away from the seashore, connected to some of the best and most interesting people in the world through our work. My husband and I have a 30 foot commute, our staff often bicycle to work, and we give ourselves lots of time off. How challenging is that?! Seriously, though, publishing is the ultimate ‘electronic village’ occupation: it can be done from anywhere. And, to keep a balance, we do in fact venture out into the ‘real world’ every now and then, to rub shoulders with activists and authors and make sure we aren’t too cut off from most peoples’ day to day realities. FPP: Your company has a focus on publishing books that help to build an ecologically sustainable and just society. How has this focus developed over the life of New Society Publishers? Chris & Judith: In the beginning, in Philadelphia, the publishing operation was the propaganda arm of the Movement for a New Society whose aim was nonviolent revolution and opposition to the war in Vietnam, to nuclear weapons, etc. As times changed, the publishing element became autonomous, and we evolved the mandate of the publishing company around what we considered to be the key overarching issues of the day. Ecological sustainability and social justice remain the deep fabric of human habitation on this planet. FPP: What is the typical profile of a New Society Publishers author – or is there such a thing? Chris & Judith: Active, committed, eloquent, upbeat, capable, compassionate – and among the best human beings in the world! FPP: New Society Publishers has gone carbon neutral. This is a pretty major step for a book publisher. What were the hurdles you had to overcome as a print publisher to get there? 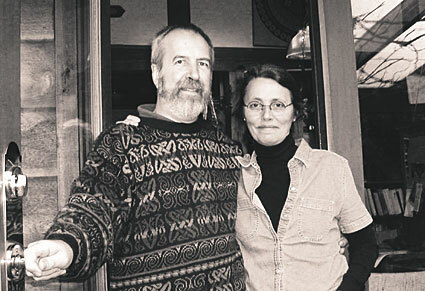 Chris & Judith: When we took the step to committing to print all of our books on 100% Post Consumer Waste paper in 2001, it was a major commitment. No-one had done such a thing before. Every other publisher thought we were crazy because it added a significant cost to the production of a book – and who cared anyway? We had three tremendous allies in taking this step. First, New Leaf Paper from San Francisco who could provide the 100% PCW paper stock and who pulled out all the stops to help us do it. Second, our printer in Manitoba who had faith enough in us to order two truckloads of paper, not knowing if we would be able to actually pull off our commitment and use it all up. And third, the Markets Initiative group who were so totally convinced that change in paper use had to happen that they inspired us to take the risk of helping to change the publishing industry. After our paper commitment, going carbon neutral was a breeze! FPP: Do you see more publishers opting for this direction in the future? Chris & Judith: Yes. The Green Press Initiative – publishers who have taken similar vows – is growing all the time. FPP: Given the concerns about global climate change and all of its effects, are you seeing more demand for your titles than in previous years and changes in the readership for your titles? Chris & Judith: Absolutely! Our topics of concern have all of a sudden become mainstream. That’s what we were struggling to achieve all along and now that it’s a reality, it’s very exciting to be at the forefront of the trend. A part of our list was always designed to ‘mainstream’ the movement; now we’re seeing way more so-called ordinary people take on the key issues of our time. FPP: What role, if any, do you see technology playing in the way you will produce and market books in the future? Chris & Judith: As Peak Oil works its way through the system, shipping a heavy commodity like books around the universe is going to have to become a thing of the past. Physical books will occupy a special and sentimental slot in our lives. Electronic books’ time will come! FPP: What do you see as the biggest challenges for book publishers in the next few years? Chris & Judith: Coming to terms with Peak Oil and the restructuring of an entire industry. Publishing has to move from: books to e-books, from bricks and mortar bookstores to cyberstores, from shelves and warehouses filled with books to point of sale machines that print books on demand – if you really need to have a physical copy at all. Is an e-Book Calling You? This entry was posted in Interviews, publishing strategy, publishing technology, readership strategies and tagged Christopher Plant, Green Press Initiative, Judith Plant, New Society Publishers. Bookmark the permalink.